The New York Times just did a very interesting piece on Jim Simons – a very successful multi billionaire ($12.5 billion) investor and philanthropist. He is also the only person to have fired me in my career, and I remain thankful for that. Reading about Jim, it might be hard to imagine a time when he was the chairman of the board of a small Apple II Clone company, Franklin Computer, and I was its president. In April 1983, I left Digital Equipment Corporation to join an early stage computer company called Franklin Computer. I left Digital because I knew that the company would not be successful in the PC business. At that time, we did not even call it a PC, instead we referred to it as a single user system. By the way, Digital Equipment Corp was known as DEC in those days. At DEC, I was responsible for the Professional Series Computers (The PRO-350 for example) which was intended to be the company’s flagship offering in what became known as the Personal Computer market. I have written about all this several times in the past so I will go easy here. Back then, I thought Dec would fail because Ken Olsen (the CEO of the company) did not believe in marketing. As it turns out, we would have failed no matter what. We were on the wrong side of history. The leadership of the computer industry was about to be transferred away from vertically integrated companies like IBM and Digital to Microsoft (software) and Silicon (Intel). I believed correctly that computer networking would play a major role in the development of the computer industry. Ethernet was just starting to emerge as the foundation for local area networks. Bob Metcalfe, the “father” of ethernet, had left Xerox Park, where he had done the initial work on ethernet, to found 3Com together with Bill Krauss. I decided to add ethernet capability to the Pro-350. I am pretty sure it was the first personal computer to have LAN capabilities. To accomplish that, I started working with 3COM in 1980 to incorporate their technology. I loved and still love network technology. So in early 1983, when I decided to leave Digital, I thought about creating a networking company. I started to investigate funding and thought about who might be able to join me. In reality, I was too scared to start a company. I had a stay at home wife and three young kids and very little money in the bank. While I was considering my next step, I was contacted by Franklin Computer, who was very interested in having me join the company. Franklin was an Apple II clone and had just released its first product. The company had been sued by Apple, but that suit was dismissed. However, Apple appealed. I was assured by the company’s lawyer that there was no way Apple would win the appeal. At the same time, Franklin was poised to go public. Once it raised money in an IPO, we would be able to set the strategic direction for the company. I was not interested in leading a clone company, but I thought I could leverage the companies capacities to launch a PC that focused on networking opportunities. Howard Morgan was then a professor at the Wharton Business School (now General Partner at First Round). He was on the board of Franklin and was very influential in getting me to join the company. 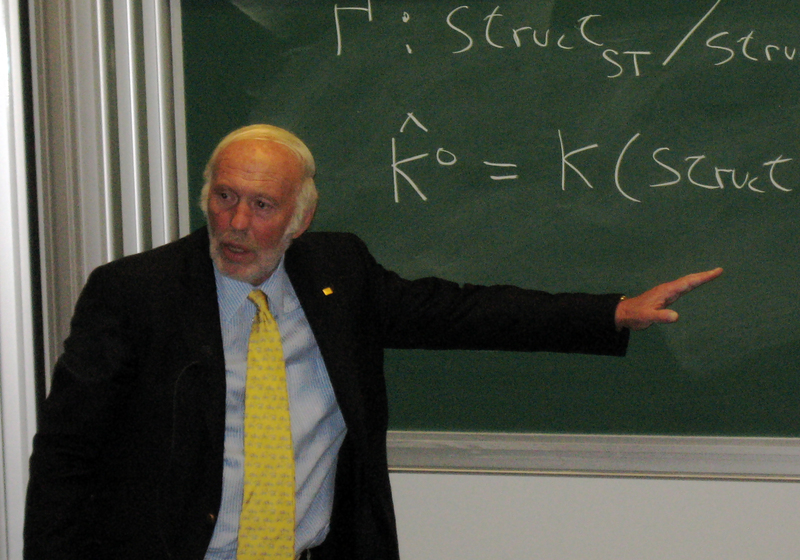 Jim Simons was an investor and the chair of the board. I learned that he was a math genius and had made a lot of money as a University Professor by developing algorithms for currency hedging. I was pretty impressed with these two guys. In order to seal the deal, the company offered me a million dollars in Franklin stock and paid the tax on it. It was a lot of money especially in 1983. So that is how I became President of Franklin Computer in 1983 and how I got fired. Things did not workout. The appellate court sent the case back to the lower court saying that they did not agree on matters of law. The lower court had accepted one of Franklin’s original arguments: firmware was not subject to copyright laws. It was a stupid argument made by the Franklin lawyers and accepted by the lower court. So when the decision of the appellate court came out, everyone thought that Franklin had lost to Apple because they did not understand that there would be a rehearing. The result of this was to kill the IPO. To make matters worse, Mellon Bank decided to revoke the working capital loan that it had made to Franklin. Things went downhill rapidly from there. Instead of trying to figure out a strategy for the future, I was selling off inventory at a loss to raise money. Instead of hiring brilliant people, I let brilliant people go. Frankly, I was not doing a very good job because I had no experience in downsizing. If I had been the right guy at one time, I was no longer the right guy. Jim realized it. Jim invited me to dinner to talk about the company. I was pretty sure that Jim wanted me to step down, and I hoped that was the case. I still had no money, and the million dollars in Franklin stock (most of which were yet to be vested) was worthless. I was hoping I would get some small settlement and then go on with the next phase of my life. Jim and I worked it out. I think we were both relieved. I never did get my settlement. My experience at Franklin was like hitting a brick wall. I felt like a total failure having traded in a big job at DEC, the second largest computer company at the time, for being the former President of a bankrupt Apple Clone. But looking back at that time, I realize that it was one of the greatest learning experiences in my career. First of all, I gained some humility, although many of my readers will laugh at that statement. I learned that just being smart is not enough and when things go bad, experience matters. I also learned that I did not like being in charge of the company. I decided that I would never take such a job again, and I never did. Four months later, I joined Intel. Tags: Apple v. Franklin, James Simons. Bookmark the permalink. You repeated a few paragraphs that appear after the heading “a million dollar signing bonus.” I think you’ll want to fix this. Loved the story, though. Apologies to everyone for the poor editing. I hope I fixed most of the errors.